At the screening of this long awaited sequel, there was a mini-featurette before the movie began in which the film’s stars – Craig T. Nelson, Holly Hunter, and Samuel L. Jackson – stress more than once that while it’s been 14 years since the original, this’ll be well worth the wait. For the most part it is. Mere months after the events of the first installment, we catch up with the crime-fighting Parr family – Bob/Mr. 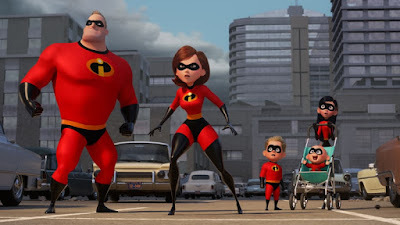 Incredible (Nelson), Helen/Elastigirl (Hunter), Violet (Sarah Vowel), Dashiell/”Dash” (Huck Milner), Violet and Jack-Jack Parr (Eli Fucile) – as they are trying to thwart a bank robbery by the returning supervillain, the Underminer (voiced by Pixar regular John Ratzenberger). This results in a pretty thrilling, funny and gorgeously animated opening sequence involving the Incredibles, with the help of the icy touch of Lucius Best/Frozone (Jackson), pulling together to stop a ginormous drilling machine from reaching its Metro Bank destination, and the follow-up is off to a great start. Things settle down a bit when the premise is introduced by a couple of new characters, telecommunications CEO Winston Deavor (a slick Bob Odenkirk), and his tech saavy sister, Evelyn (a more energetic than usual Catherine Keener). The Deavors wants to arrange a campaign that will make the use of super powers legal again, and recruit Elastigirl to go off and fight crime in the dangerous city of New Urbrem, while Bob stays home to take care of the kids to his great disappointment. But while stranded at home, Bob learns that Jack-Jack has an array of super powers (17, he says at one point) including being able to shoot lasers out of his eyes, teleport through walls, turn himself into fire, and change into a scary red monster (sort of a like a fiery Tazmanian Devil) if he’s denied a cookie. Since Odenkirk’s Winston is such an unabashed fanboy of the Incredibles who knows the words to all of their individual theme songs, he stands out as a candidate for the film’s secret bad guy, but gladly screenwriter Bird knows that would be too obvious. As for the film’s up front villain, there’s the Screenslaver, dressed in black with big goggles like a cartoon Kylo Renn, who can hypnotize people through their screens. There’s also the thread that the secret baddie (I won’t Spoil their identity) has devised glasses that control the wearer in order to frame them doing acts of evil. That’s a pretty predictable plotline that’s been done to death, but the action and laughs come so fast and frenetically in the film’s last third, which is set on runaway ship headed to crash into New Urbrem, that it really doesn’t get in the way of the extreme entertainment factor. Sure, the overall world of the INCREDIBLES doesn’t feel as fresh as it did in 2004 (still looks really cool though), but despite its formulaic flaws, it’s a joy to spend time with these characters again on another fast paced ride. 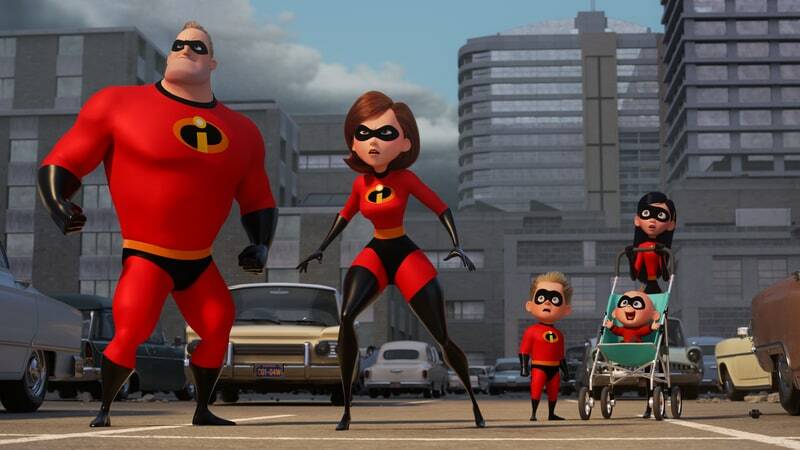 INCREDIBLES 2 is a solid sequel that should please the many big fans of the first one, as it did a casual fan like me. Thanks for the update, Bird, Pixar, and all the great voice talent – see you in another 14 years!